I've become spoiled. 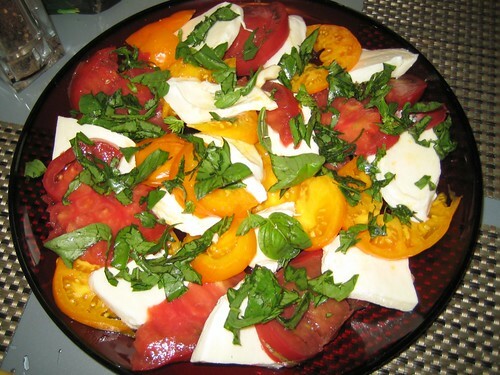 When I couldn't find local, organic mozzarella at the market this week I went home and made it myself! The tomatoes are from our overflowing garden. Paired with fresh bail and sea salt—heaven! 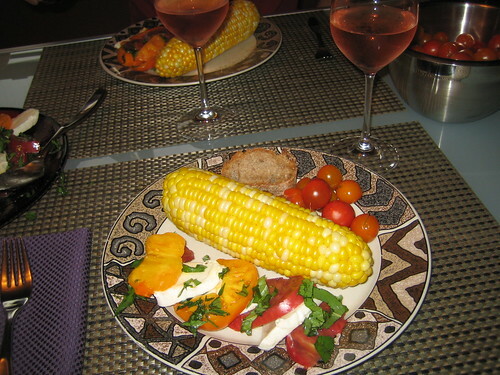 Add some amazing corn on the cob, a little whole wheat baguette, yet more tomatoes (cherries), and a crisp rosé. I could happily eat like this everyday. On an unrelated note, I promise to get the last of the camp photos up soon. The last few days were jam-packed, and there are a lot of photos to sort through. Stay tuned. And then I think it's time to do some recipes again. What do you think? Cooking? Baking? What are you in the mood for? Well...autumn is on it's way. What kind of august food would be fun to master? Looks delicious, what time is dinner? ;-) Okay for recipes I agree August easy harvest meals and no cook recipes sound great. Di: Can't quite wrap my brain around autumn yet! Although it is my favorite cooking season! Leslie: Yes, I think some no cook and chilled foods are in order. Stay tuned!